The good:Great ingredients, even better customer service. The bad: Not much bad here. The marketing is hype, but they don’t over-hype the product. The bottom line: Fenphedra gets a very rare thumbs up. This is a reccommended product. It’s a little more pricey, but you get what you pay for on this one. 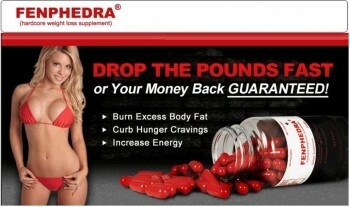 A “High Performance Weight Loss Formula”, this is how the Fenphedra supplement explains itself. Utilizing the same marketing campaign as Nuphedragen (reviewed here). Nuphedragen was around in the diet pill industry first, but that does not mean first is always better. Fenphedra actually edges out Nuphedragen in the end. In an ever growing trend in the diet pill industry, Fenphedra is created by the company Fenphedra, Inc. It seems that many diet pill companies are creating these mini-businesses in order to brand each diet pill as a sole product. This way, if they produce a pill that is marked a loser, that company name will not hamper the next product. However, there are still a few companies out there that have the money to brand their name no matter the product results. Muscletech, for instance. Have you ever heard of a little known product called Hydroxycut, see? Product Inquiry: I sent out a product inquiry to the customer service email address. I wanted to know about the efficacy of the product. I received a response the same day. Rude Customer: I sent along an email that was less than happy. I claimed to have ordered Fenphedra two weeks prior without receipt. Guess what? I received a response from a person. The response stated my order could not be found with my sending email address and asked me to send along my full name, not my address, order number, social security number, bank account number, etc…, just my name. The rep stated they would find my order and even send me out a FREE bottle for my trouble. To top the cake, when I did not respond, the customer service rep wrote to me email address again forwarding the original email. Ha! There are great customer service reps out there and they work for a diet pill company. Fenphedra does not use a proprietary blend. Let me say that again, the makers of Fenphedra do NOT use a proprietary blend. That is a GREAT thing. Many diet pills will use the words “proprietary blend” to cover up a list of useless ingredients. · DiCaffeine Malate is simply a caffeine supplement with a snazzy name. The DI and the Malate mean nothing when it comes to the efficacy. But, luckily, caffeine is proven to work as a weight loss aid. Caffeine research. I approve. · Chocamine is a cocoa with amino acids and essential minerals. While cocoa has support in the scientific community, Chocamine offers no supporting documentation. I reviewed Chocamine here. Neutral. · Phenylethylamine is present in chocolate and tends to offer “good” feelings and counteracts the jittery feeling associated with caffeine. I have also reviewed Phenylethlamine. · Synephrine (Synephrine in depth analysis) With the ban of ephedra, diet pill creators tried to replace that product. They came up with synephrine. But, there has been no link between ephedra and synephrine. · Humulus Lupus is a well regarded “folk-lore” supplement that helps to counteract the stimulation of the caffeine. With information available from Purdue and with a nice sized write up in encyclopedia.com (with research references), I am thoroughly impressed. The use of Humulus Lupus is what makes me support Fenphedra a bit more than the Nuphedragen. FEN-72 is a detoxifying blend. While the ingredients are not listed for the detox solution, they are more than likely the same ingredients used by all diet pills for detoxing. Detox pills should only be used for the short term. The marketing campaign is all about the hype, but what diet pill company does not hype up their product. Upon some further research, it seems the community of users reports less jitters with Fenphedra than with Nuphedragen. (Totally unscientific). My final thought, and this is rare, a thumbs up. The customer service blew me away, but more than that, the product ingredients are sound and that makes for a great diet pill product. This pill caused me to eat less. I continued to get hungry, but would stop before over eating. It also curved my cravings some. I didn’t feel anything, as if I wasn’t taking anything which was great. I only had 10 lbs to lose and lost 5 lbs. I have thyroid problems, I love exercise and love veges, so I’m a tougher case than most as far as these last 5 lbs. Also I am over 40, so, if I find a diet pill that curbs my appetite better, doesn’t make me feel bad and I actually lose that 5 lbs, then I would rate it a 5. This is the best diet pill I’ve tried so far.